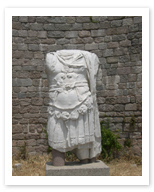 Chances are, you’ll feel as if you’re walking through a vast outdoor archaeological museum for the entire time you’re in Bergama. Nonetheless, there’s an indoor collection as well. A sizeable array of artefacts has been given over to this museum located in the town center. Newly renovated, with nice sculpture and ethnography sections, this museum is a pretty good site for the traveller who hasn’t seen quite enough of the impressive relics offered by the ancient city itself.